Liberty University’s board of trustees recently approved a new policy allowing students and faculty members with permits to carry concealed weapons on campus. According to Liberty General Counsel David Corry, students who posses permits accepted by the Commonwealth of Virginia and who are also approved by the Liberty University Police Department (LUPD) will be allowed to conceal carry in all areas of campus, excluding residence halls. “It appeared from the discussion that the board felt that allowing guns would increase safety on campus,” Corry said. Corry also said that he believes Liberty’s campus is already extremely safe, but that the new policy will provide for an even safer atmosphere. “I think that people will feel safer as they go from their vehicles to class and so forth, and I think somebody that might want to do us harm will not feel good about coming to Liberty University because that person might encounter more than just law enforcement that’s armed,” Corry said. Liberty senior Craig Storrs said that he feels safer knowing that more people will be allowed to carry weapons in the classroom. As a member of the Student Government Association, he began petitioning for the policy change in 2010. “We saw what happened with Virginia Tech, and we also saw what just happened with Sandy Hook, and it’s proven that those campuses that do allow concealed carry for their students have been statistically less likely to have crimes occur,” Storrs said. Research conducted by Liberty revealed that 29 colleges and universities around the nation already permit students and employees to possess or store weapons on campus. The University of Colorado, Colorado State, Michigan State, the University of Mississippi and the University of Utah are examples of the colleges that currently allow weapons on campus in some capacity. “I think this is probably the trend for of lot of schools, to not want to be set up to be weapon-free zones, to look like attractive targets, and this is one step to help ensure that they don’t look like that, and (that) they aren’t setting themselves up to be vulnerable,” Corry said. Corry also said that Liberty began allowing weapons in some areas of campus about two and a half years ago and has experienced no accidental or intentional incidents with firearms. 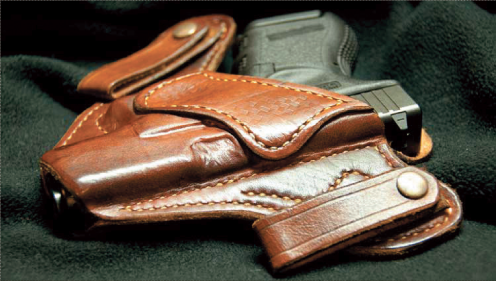 According to Corry, those wishing to carry concealed weapons on campus must be approved by LUPD before they may do so. Police will ensure that an applicant has acquired an eligible permit and has completed the required training. Before granting permission, officers will also examine internal records and check if anyone has requested that the individual not be allowed to carry on campus. Corry also said that those carrying concealed weapons are already around students while they are off campus. “The fact that those people might also be carrying the concealed weapons that they’re permitted to carry around town on is really not a big difference at all,” Corry said. Great Story, glad to see that Liberty is behind the proper use of firearms for protection. I support every citizen having the right to protect themselves, however I don’t know how I feel about students being allowed to carry on campus. Universities have traditionally been a gun free place. I’m open to change my opinion though. This is a great way to support the constitution, not to mention an ability to protect yourself from those who would do harm to others..These are GOD given rights..